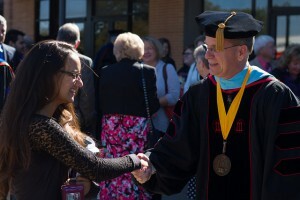 Dr. Ken Shaw greets Raquel Acevedo, freshman education major, after Inaugural Ceremony. To formally welcome new president Dr. Ken Shaw, Southwestern Adventist University held a two-day inaugural celebration last week that stirred up quite the excitement among students around campus. The events consisted of an Inaugural Gala, a $100-a-seat benefit dinner to raise money for student scholarships, the Inaugural Ceremony, featuring faculty, past presidents, Board members, delegates, emeriti, and community guests, and a light lunch reception in the Chan Shun Centennial Library lobby. A great deal of work was put into the preparation and execution of these events. For the actual Inauguration, the Wind Symphony, orchestra, and University Singers all performed pieces for the processional, anthem, a choral response, and the recessional. The processional was accompanied by a bagpipe player in a kilt, a rare sight on the campus of Southwestern. Each university group as well as the community provided a welcoming speech: the student body, the faculty and staff, the board of trustees, the alumni association, the community, and other colleges and universities. After the greetings, Shaw gave his inaugural address, which many students found very inspiring and a great personification of who Shaw is and what he intended for the future of the university. Perez shared his testimony at the Inaugural Gala, about how his academic success through a four-year university could only be attributed to God and the willingness of donors to express their generosity through funding student scholarships. Some students, like Kayla Federowski, junior education major, didn’t expect such a “real” speech and were surprised to hear a deeper meaning in Shaw’s message than they expected. Edwin Choque, senior nursing major, also expressed similar feelings about Shaw’s speech. “I think the way he talked about the Southwestern mission really made everything fall into place as to what we stand for as a university,” Choque said. Overall, students really seem to enjoy Shaw’s presence here on campus. They appreciate his willingness to get to know the student body and to participate in events while showing exceptional skills in getting things moving so quickly in his first semester here.